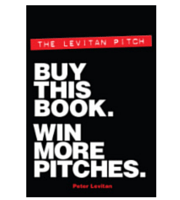 The Video: How To Write An Advertising Agency Book - Peter Levitan & Co. Here is a video of the talk I gave at HubSpot’s Inbound 2014 conference. Watch my presentation to find out how to write an advertising agency book by mid 2015. Yes, you can do it. The video will show you how to get a good head start on adding this special arrow to your new business quiver. I discuss the multiple benefits of writing a book; that it can be done relatively quickly (I wrote my 65,000 word The Levitan Pitch, Buy This Book. Win More Pitches. in less than 6 months); how the book will drive your thought-leadership program and how your agency is particularly well set up and well endowed to get a great business-building book out the door. Here is my dedicated post on writing an advertising agency book and how it can be used for new business outreach. The post includes the PowerPoint presentation I used in the following video. To help you find the gems in the 30 minute talk, I’ve put some highlights below. OK, Buy The Book – I wrote my book for you. I want you to win more pitches. If you read the book you will pitch better than your competition. You will mange your agency’s pitch process much better. You won’t burn out your employees. You will reduce your pitch budget. You will arrive better prepared. You will win more pitches. This entry was posted in Book, eBook, Featured, Marketing, New Business, Personal Branding, Pitching and tagged ad agency, book, branding, marketing, new business, personal branding, Pitching, presentation, video. Bookmark the permalink. Trackbacks are closed, but you can post a comment.